TIME FOR WAR (AUS) (Bay 2011-Stud 2015). 3 wins at 2, A$470,950, ATC Pago Pago S., Gr.2, BRC Sires' Produce S., Gr.2, ATC CFMEU Mining & Energy 2YO P., 2d Gold Coast Guineas, Gr.3, ATC Brian Crowley S., L, SCTC Glasshouse H., L, 4th ATC Sires' Produce S., Gr.1. Grandson of SW Miss Power Bird, a half-sister to SW Lucky Owners (Hong Kong Mile, Gr.1). Related to SW Mosheen (ATC Randwick Guineas., Gr.1), etc. His oldest progeny are yearlings. SHADOW GRANDE, by Dane Shadow. Unplaced. Three-quarter-sister to HURTLE MYRTLE, half-sister to WHISPER BAY (dam of INDIAN THUNDER). This is her first living foal. INDIAN THUNDER (Manhattan Rain). 2 wins-1 at 2-at 1050m, 1250m, A$129,345, to 2017-18, SAJC Queen Adelaide S., L, Boxing Day Family Races H., 3d MRC Le Pine Finerals H.
Future Force. 5 wins to 1400m, A$103,810, AJC Time & Tide H., Turnbull & Turnbull H., Illawarra TC Bert Lillye Cup, STC Flexi Betting H., 3d QTC Mister Hush Welter H., STC 2MMM Slipper Saloon H., Westmead Childrens Hospital H.
HURTLE MYRTLE (Dane Shadow). 4 wins-1 at 2-from 1200m to 1600m, A$773,700, VRC Myer Classic, Gr.1, ATC Sapphire S., Gr.2, BRC Dane Ripper S., Gr.2, STC Freeway Republic Beer 2YO H., 2d AJC Furious S., Gr.2, Surround S., Gr.2, ATC Premiere S., Gr.2, 3d AJC Flight S., Gr.1, Silver Shadow S., Gr.3, Inglis 2YO Classic, 4th ATC Queen of the Turf S., Gr.1, STC Tea Rose S., Gr.2, Triscay S., L. Producer. STAR WATCH (Bletchingly). Head of The 1987-88 Australasian 2YO Classification. 6 wins-5 at 2-at 1100m, 1200m, A$1,246,300, STC Golden Slipper S., Gr.1, AJC Up & Coming S., Gr.3, STC Skyline S., Gr.3, AJC Botany Bay H., Kindergarten S., NSW Tatt's RC JB Olliffee H., 2d STC Pago Pago S., Gr.2, VRC Ascot Vale S., Gr.2, 3d Moonee Valley S., Gr.2. Sire. FORCE APOLLO (Catrail). 6 wins-1 at 2-to 1400m, A$331,580, STC Heritage S., L, Darby Munro S., L, Cody Premium Outdoor H., 2d NSW Tatt's RC Roman Consul S., Gr.3, Hawkesbury RC Safilo Cup, L.
SPEEDY LEO (Nadeem). 2 wins at 1100m, 1400m in Macau, Macau Lisboa Challenge, L, Lisboa Prelude, L, 4th Macau Lisboa Juvenile, L.
GRACEFUL ANNA (Canny Lad). 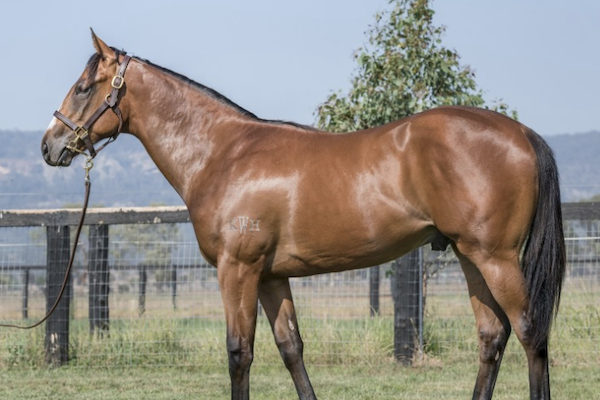 6 wins to 1400m, A$1,031,050, BRC Vo Rogue P., Gr.3, GCTC Magic Millions 3YO Trophy, RL, 2d ATC Breeders Classic, Gr.2, Liverpool City Cup, Gr.3, Millie Fox H., Gr.3, 3d BRC BTC Classic, Gr.3. PRINCE RUBITON (Rubiton). 8 wins to 1400m, A$280,500, MRC Japan Racing Association S., L, 2d MRC WJ Adams S., L, 3d MRC Moonga S., Gr.3, Mornington RC Hareeba S., L.